Sun., April 7, 2019, 4:39 p.m.
COEUR D’ALENE, Idaho – Mike Anderson ate stir-fried squash last summer that excited his palate. His mother-in-law used the squash grown in local compost to prepare a dish that was marvelous, despite Anderson’s initial coolness. Being a scientist, however – Anderson’s background is biology – he couldn’t resist testing the final results of the composting process that starts at the Coeur d’Alene wastewater plant and goes through a series of bacteria-championed cycles before becoming dirt to grow vegetables that land on a dinner table. If a caveat exists to defy the wonders of nature that can turn human waste into fine dirt that feels rich when it’s sifted through open fingers, it is mostly first world. “There’s kind of an ‘ick’ factor,” Anderson, Coeur d’Alene’s wastewater manager, told the Coeur d’Alene Press. Known as Coeur d’Green, the city-made compost is sold at three area nurseries. For two days this spring, April 20-21, during its annual free compost weekend, the city plans to give the stuff away at its plant at 3500 N. Julia St.
No, this is not a gag. It’s part of a marketing plan that began last year as the city ramps up its production of Coeur d’Green, in part because a new filtration system at the wastewater plant removes 15 percent more solids. That, in turn, will be used to create more compost. The city has invested an additional $700,000 in a new storage building, expanding the Coeur d’Green plant’s capacity by 30 percent, which means none of its solid waste goes into a landfill. That’s great news for area gardeners, turf growers and pomologists. “It does make stuff grow like crazy,” said Nikki Roberts of Rock Hound garden and landscape supply, along Highway 41 and Poleline Road in Post Falls. “A lot of people really love it,” Roberts said. Her business buys and hauls it by the dump truck-load from the city’s facility to its retail property, where customers buy it by the yard. Despite its popularity, some in the gardening population hesitate at the Rock Hound compost bins before deciding on brands. “Some people are a little bit freaked out by it,” Roberts admitted. Anderson is more enthusiastic than freaked out. He shows visitors touring the city’s wastewater facility a patch of pumpkins grown in compost along the fence bordering the Centennial Trail. Last year the city gave more than 200 pumpkins to the library, all of them nurtured in a warm bed of Coeur d’Green compost before being painted with ghoulish faces as a children’s Halloween project. Built in the 1930s, the Coeur d’Alene wastewater facility is mostly gravity fed. “We are at the lowest part of the city right here,” Anderson tells visitors from the shade of a towering tank called a clarifier, used in one of the many steps that separate solids from liquids. The plant has expanded over the years. It now collects 4 million gallons of waste – mostly water – daily. After being treated and having bacteria, nitrogen and phosphates removed, the water is returned to the river. Solids are shipped to the compost plant, where they’re mixed with wood chips and, through a biological process, heated to temperatures of more than 150 degrees to kill pathogens. By the time the solids are remixed and reheated, aerated and seasoned, they are effectively a sterile gardening product; the same stuff that grew Anderson’s squash. 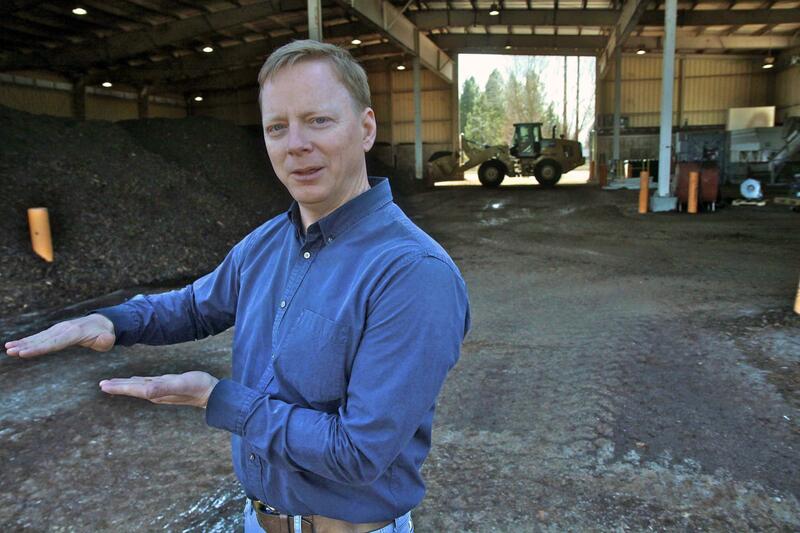 Paul Mitchell, who has operated the city’s compost plant since its development in the 1980s, said the Coeur d’Alene facility is state of the art, producing the finest compost money can buy. Since its development in the 1980s, Coeur d’Green has been tested and given high marks by scientists from the Department of Environmental Quality and by the University of Washington. Back then, with a growing population and a climbing bill from the landfills that handled the city’s solid waste, Coeur d’Alene decided on a new tack. With the help of scientists and Mitchell’s own gardening prowess, a top-quality compost was soon developed. Coeur d’Green worked so well that people complained about it. Residents who purchased Coeur d’Green for their lawns complained it made the grass grow too thick and fast. Gardeners said it resulted in too much bounty. “I told them to use half as much,” Mitchell said. Mitchell raves about Coeur d’Green’s purity, its absence of salts and metals often found in other compost products. Because demand is seasonal and sales regional, Coeur d’Green adds just $35,000 annually to city coffers. Anderson is working on a plan to move more product by finding more uses for it. “They call compost black gold,” he said. Published: April 7, 2019, 4:39 p.m.